Tommee Tippee is an internationally renowned baby products manufacturer, offering baby bottles, breast pumps, sippy cups and other baby feeding products. Closer to nature, In 2006 Tommee Tippee revolutionized the infant feeding market with the launch of the closer to nature line of baby bottles and accessories. Inspired by nature and developed in conjunction with midwives, breastfeeding moms and babies, closer to nature bottles are designed to be the closest thing to natural breastfeeding during the very early stages of baby’s life, from first latch to weaning. The closer to nature range includes baby bottles and teats, sterilisers, breast pumps, soothers, teethers, bibs and more for children up to 18 months. 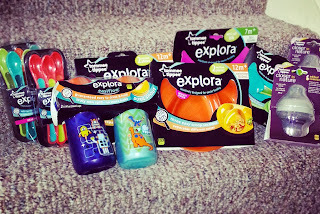 Explora, Tommee Tippee explora range includes BPA-free toddler drinking and feeding products to help teach children how to eat and drink the easy way, offering a seamless transition from those first steps, through to independent feeding and drinking. Each explora cup is progressively staged with a specific spout and grip to meet the needs of every age and stage while supporting natural oral development. Bright colors, appealing designs and coordinating mealtime products reflect the individual styles of parents and their children, while making drinking and eating fun. Closer to Nature Added Comfort Feeding Bottles- These bottles are amazing, they are designed to help reduce air ingestion, they have a breast like shape. Also the Closer to Nature Added Comfort Bottle’s venting tube changes color if the temperature of the milk is above the recommended 98°F, for added reassurance. Now how cool is that? 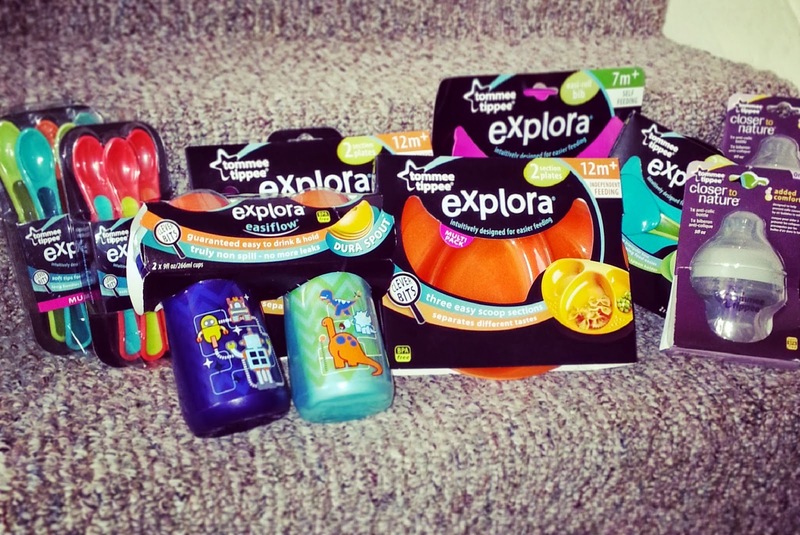 Explora Truly Spill Proof Drink Cup- Sophia absolutely LOVES this cup and I love that it's truly non spill and leak proof! They are also BPA free! One of the best cups we have ever used!!! Easi-Roll Bibs- These are innovative and convenient, with a crumb catcher to collect mess and a dimpled reverse to encourage air flow and prevent irritation on delicate skin. They also roll up easily for storage and travel. This is probably the coolest bib ever and talk about easy clean up! Explora Heat Sensing Spoons- Change color from red to yellow if food is too hot – ideal if you’re using a microwave to heat food, as you can tell at a glance when it’s safe to feed your baby and when it’s not. These are also suitable for babies aged 4 months +, great for BLW! 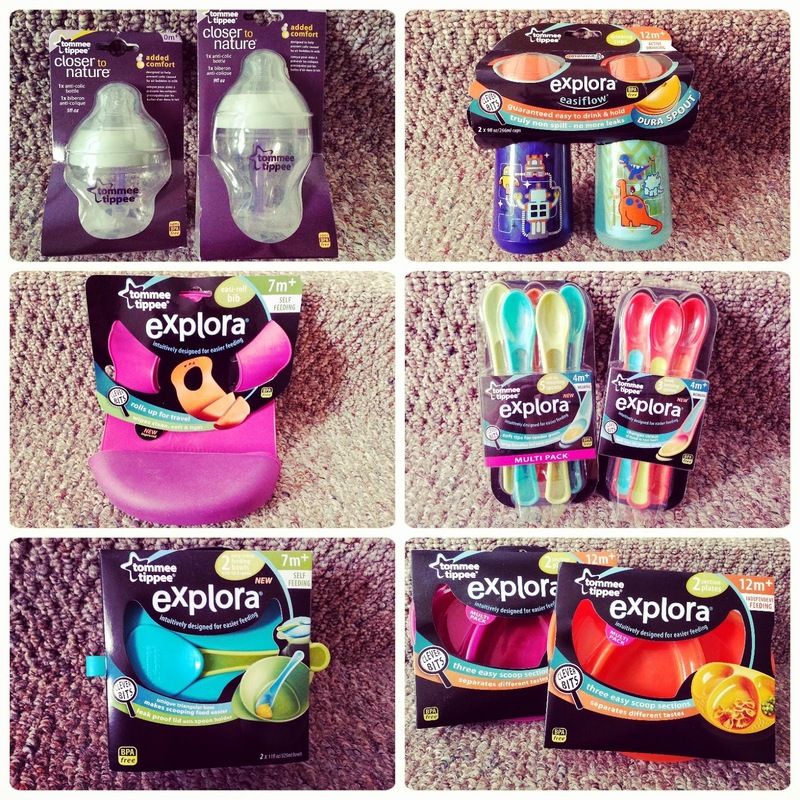 Explora Easy Scoop Feeding Bowls with Lid and Spoon- Includes 2 bowls, a leak-proof lid and an easy-grip spoon. They are a must-buy for easy feedings on the go. The easy-scoop triangular base helps with self-feeding and they fit with they're Easi-Mat too, meaning less mess & stress. Explora Section Plates- Are perfect for family mealtimes: the 3 sections mean you can introduce your toddler to new tastes without them all merging into one and because they fit with our Easi-Mat, there’s less mess too. 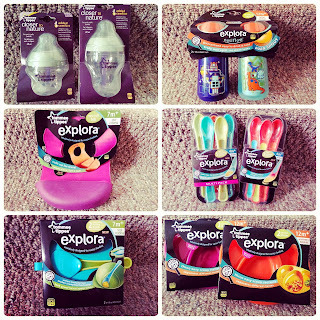 Tommee Tippee has always been my go to brand and they’re new products are simply amazing. Everything is extremely affordable and much safer for your baby and/or toddler! The prices range from $4.99 to $249.99 (if you are looking for an electric breast pump)! I highly recommend this company and if you haven't already, be sure to give Tommee Tippee a try. You can find Tommee Tippee at Target, Babies R Us and Amazon. DISCLAIMER: All products received are complimentary for testing purposes from Tommee Tippee. All opinions stated are my own and are not influenced by any affiliates. Yes, I want ALL of these! Giveaway, please! HA HA. I love the Tommee Tippee on the go heater that looks like a thermos. Awesome for long road trips. Oh that's cool. I only knew about the bottles. I will have to look into this for my niece & nephew. Thanks for sharing. Not entirely a fan of Tommee Tippee. I didn't use their bottles but used their training cup and it didn't work out for us but have heard that their other products work really well. Thanks for the review. How lucky of you to get such amazing set of baby products. Didn't know about this brand, thanks for the review. My sister uses several of their products and loves them! I love the great selection of colors and patterns on them! when we have a child, I will definitely be getting some of their products! I was so sad that these came out after I had my son! They so cool and I'd love to try them if we decide to have another baby. Thanks for the review!